Why Buy DOT Compliant Lighting? What is DOT Compliant Lighting? What Safety Tests Must Be Passed For A Light To Be Compliant? How Can You Tell if a Light is DOT Compliant? Meeting DOT lighting standards guarantees your lights are federally compliant for visibility, durability, and reliability to secure the safety of others. Ensuring your lights meet DOT requirements can reduce your liability in cases involving property damage or personal injury. Do you know if your lights are not DOT compliant you can receive a ticket? 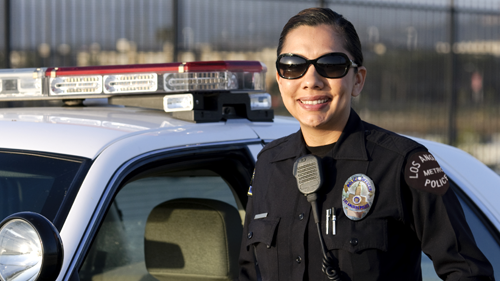 All Blazer lights are DOT compliant and eliminate the threat of a citation. DOT compliant means that the lighting meets section 108 requirements of the Federal Motor Vehicle Safety Standards (FMVSS). These standards regulate all automotive lighting, signaling, and reflective devices. The FMVSS are established and administered by the National Highway Traffic Safety Administration (NHTSA), an arm of the U.S. Department of Transportation (DOT) and an executive branch of the U.S. government. NOTE: Having all DOT compliant lighting does not ensure your truck, bus, MPV, or trailer is DOT compliant. Each vehicle type must also have a specific configuration of lighting products to be DOT compliant. Click here to see your configuration. 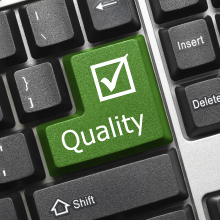 Meeting SAE design standards means both designing and testing products to meet performance and quality standards. Listed below are examples of performance and quality tests that products must be designed to meet or exceed. 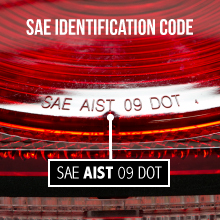 Check your lighting for an "SAE" identification code - it is usually located or molded into the plastic on your light. The Society of Automotive Engineers has been involved in developing standards for automotive lighting used within the Federal Motor Vehicle Safety Standards and have further developed a uniform identification code that is used by all reputable manufacturers. The code is shown in this example and the SAE indicates the lamp has been designed to SAE specifications as indicated by the following letter codes. A = Reflex Reflector, I =Turn Signal, S = Stop Lamp, T = Tail Lamp. The remaining numbers indicate the year the lamp was certified. For a table of SAE Codes, Click Here.